ROGAINE® is the #1 Dermatologist Recommended hair regrowth treatment. When you use Men’s ROGAINE® Foam every day, you can revive your hair follicles and maintain hair density over time. Easy to use: no topical hair growth treatment for men works faster to regrow full, thick hair. Clinically proven to regrow up to 25% more hair in 3 months*. FDA-approved hair restoration formula with minoxidil. Patented Tricho-Prime™ technology starts to work on contact. Satisfaction Guaranteed**: if you’re not fully satisfied we’ll refund your purchase price, no questions asked! Use as directed. Not everyone responds to ROGAINE® products. Individual results may vary. Save time — Order once, and done! Cancel anytime. Save money — Save up to 15% per order. Hold the can upside down and dispense half a capful of foam onto clean, dry fingers (apply twice a day as directed). Use only the recommended dosage of half a capful, 2x a day for Men. 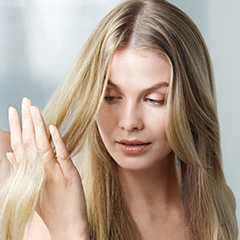 Using more or more frequently will not enhance or hasten hair growth. Continued use is necessary to improve and maintain your hair regrowth.